Home builders captured market share in 2012 for the first time since 2005, accounting for just over 7% of all home sales, and we believe even more market share is in the cards for 2013. Over the last 20 years, new homes have constituted 13% of total home sales. At +20% y/y, the new home market more than doubled the +9% y/y growth achieved in the resale market last year. As shown below, this recovery is playing out very differently from that of the 2001-2005 upturn, where new and resale sales growth moved almost in lockstep. Foreclosures, by definition, are existing homes. Debt and equity capital for new home construction became very difficult to obtain. Home builders stopped building because the opportunities to make money declined dramatically. New homes are located where the land is, which tends to be in outlying areas that got hit harder in the downturn. Additionally, publicly traded home builders have captured significant market share because their access to capital has been much better than private builders. Publicly traded builders have raised low-cost, unsecured, non-recourse debt that matures many years from now, while most private builders can only borrow from banks on a secured, recourse, short-term basis. 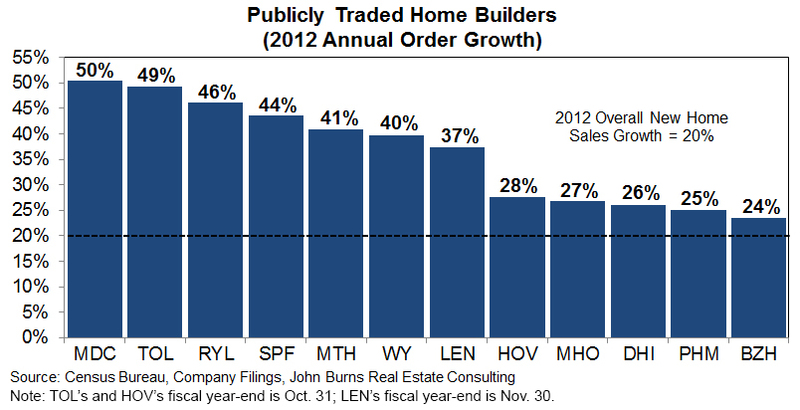 As shown below, twelve publicly traded home builders grew more than 20% last year. Quality. 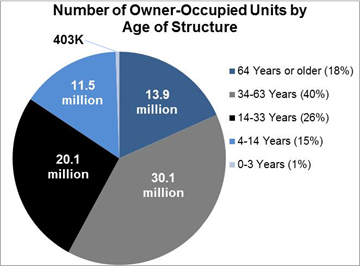 The lion’s share of housing stock is more than 10 years old with a median age of 39 years. Negative Equity. 10.7 million homeowners who purchased homes during the subprime credit heyday are still underwater on their mortgages and cannot sell. 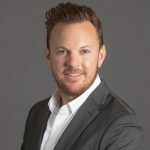 Home prices need to continue to appreciate in order to bring those homeowners above water, subsequently enticing them to list their homes to at least break even. Low Supply. Many markets across the country have less than three months of supply of homes for sale, including Austin, Denver, Los Angeles, Orange County, Orlando, Phoenix, San Diego, and Seattle. Sacramento, San Jose, and Oakland have less than one month of supply! For perspective, seven months is the historical average. If you have any questions, please contact Rick Palacios Jr. at (949) 870-1231 or by email.